The Obama administration stands ready to offer "any type of assistance" to Libyans seeking to oust Muammar Qaddafi, Secretary of State Hillary Clinton said Sunday, adding a warning to other African nations not to let mercenaries go to the aid of the long-time dictator. Clinton echoed President Barack Obama's demand for Qaddafi to relinquish power. "We want him to leave," she told reporters traveling with her Sunday to a U.N. meeting on Libya planned for Monday. "We want him to end his regime and call off the mercenaries and forces loyal to him. "How he manages that is up to him." Clinton made no mention of any U.S. military assistance in her remarks to reporters before flying to Geneva for talks with diplomats from Russia, the European Union and other powers eager to present a united anti-Qaddafi front. CBS News national security correspondent David Martin reports that the Navy has moved several ships - including the aircraft carrier Enterprise and the amphibious assault ship Kearsarge - into the Red Sea in preparation for sending them through the Suez Canal and into the Mediterranean, depending on what (if any) military options are approved. As of now, no U.S. military action is ordered. Clinton spoke to reporters one day after Mr. Obama branded Qaddafi an illegitimate ruler who must leave power immediately. The U.N. Security Council announced new penalties against the Qaddafi government, in power since 1969 in the oil-rich nation along Africa's Mediterranean Coast. 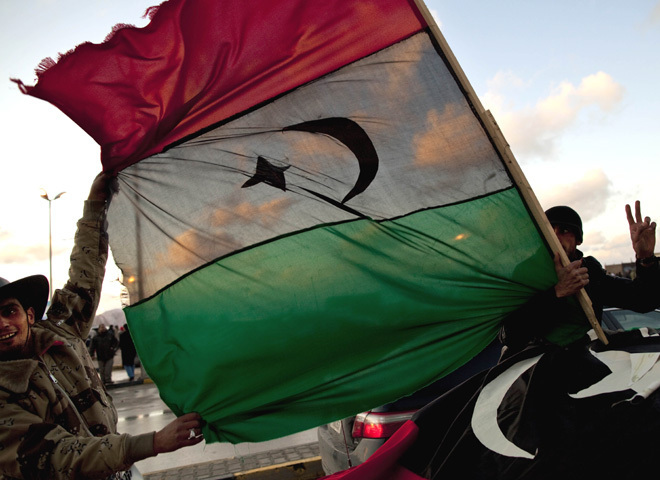 "We've been reaching out to many different Libyans who are attempting to organize in the east," the Secretary of State said of efforts to form a provisional government in the eastern part of the country where the rebellion began at midmonth. She added, "We are ready and prepared to offer any type of assistance." The U.S., she said, is threatening more measures against Qaddafi's government, but did not say what they were or when they might be announced. Addressing the rulers of unnamed neighboring countries, she said, "You must stop mercenaries and those going to Libya to commit violence and other criminal acts."